200 ft Stainless Steel Cable for Mobile Skywalk temporary horizontal lifeline systems. Cable assembly includes on finished swaged end, and one unfinished end with two fist grips and thimble for manual termination. Jaco Aerospace and Industrial is your one stop resource for 3M(TM) 200 ft Stainless Steel Skywalk Cable SWMS-200-SS, 1ea/cs and all of your 3M Products, Tapes, aerospace and industrial needs. 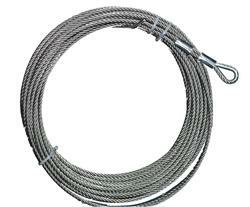 SKU Marketplace Product Description: 200 ft Stainless Steel Cable for Mobile Skywalk temporary horizontal lifeline systems. Cable assembly includes on finished swaged end, and one unfinished end with two fist grips and thimble for manual termination.